Three major European bioscience countries have belatedly published their 2016 statistics (note that the Czech Republic became the first EU country to publish their 2017 statistics last week) – France, Italy and Netherlands. For national statistics of almost forty countries from 2012-2017, check out our newly updated Historical Statistics page, or see our Worldwide Statistics page for a direct comparison. 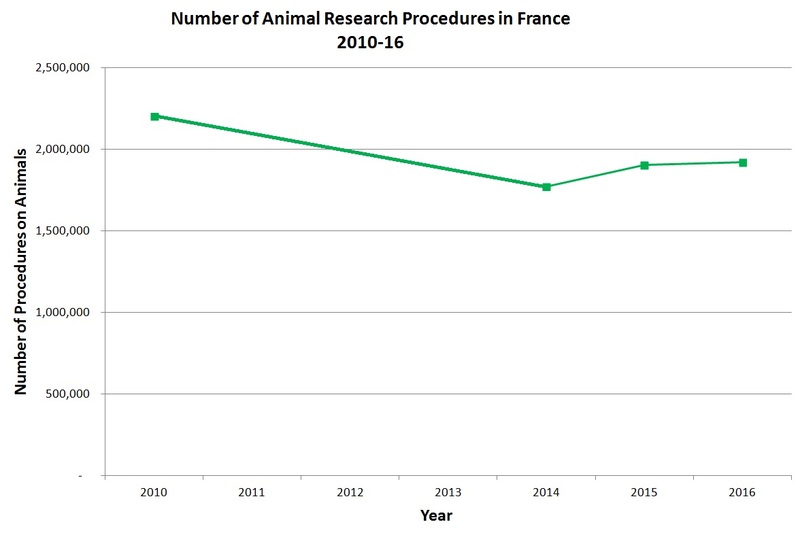 Until 2013, France released their animal research statistics on a triennial basis. Since 2014 and the implementation of EU Directive 2010/43, the French Ministry of Higher education, Research and Innovation began publishing animal use statistics on an annual basis. 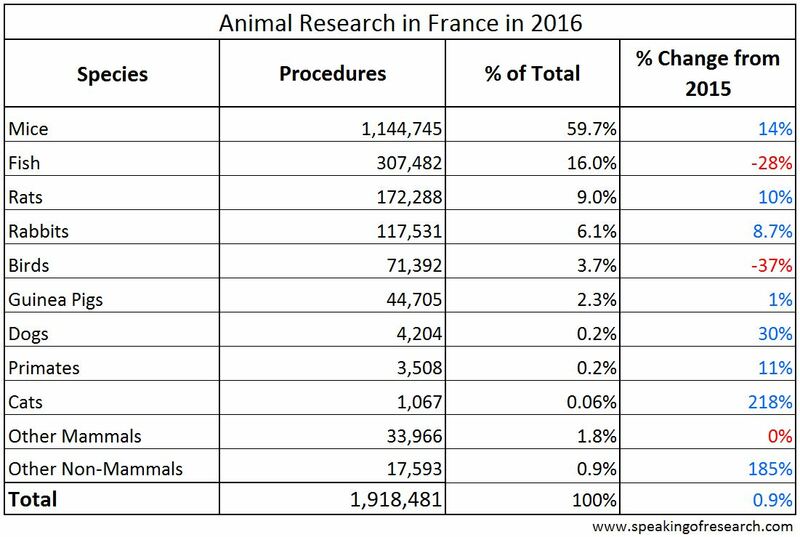 According to figures released this month (permanent link), France conducted 1,918,481 procedures on animals in 2016, a 0.9% rise on 2015. While the overall figures have risen by less than 1%, the changes in numbers for each species have been much more variable. There were increases in the use of mice (+14%), rats (+10%) and rabbits (+9%), while numbers of fish (-28%) and birds (-37%) fell considerably. There were also increases in the use of dogs (+30% to 4,204 procedures), primates (+11% to 3,508 procedures) and particularly cats (+218% to 1,067 procedures), however, these species together still account for less than 0.5% of all animal procedures in France. 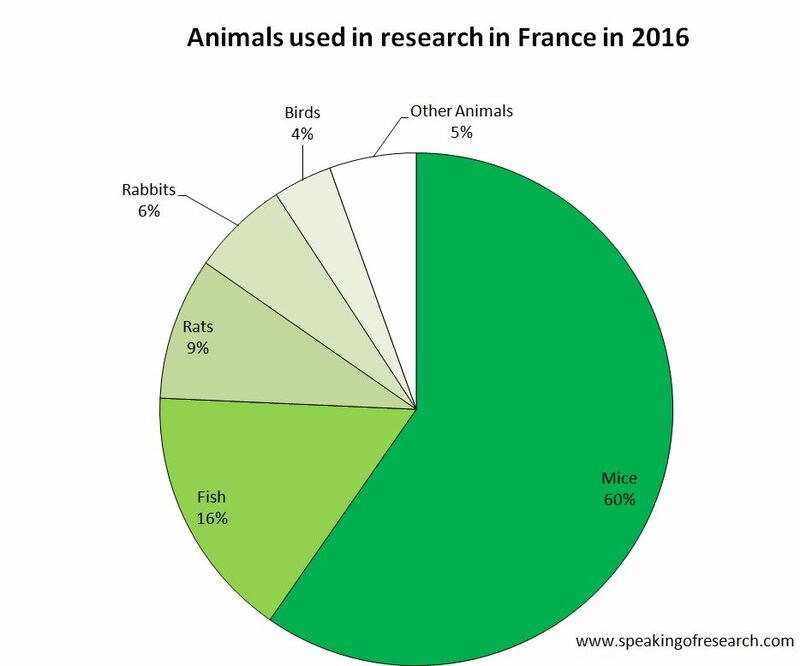 Mice, fish and rats account for 85% of animal studies in France. Unusually, rabbits are the fourth most used animal at 6% (though this is similar to neighbouring Belgium), followed by birds. Mild or Non-Recovery (where the animal is anaesthetised and never woken up) accounted for 45.5% of procedures, Moderate accounted for 37.9%, and Severe procedures accounted for 16.7%, a high proportion relative to most European countries (and up from 10.2% in 2015). The high level of severe procedures is similar to what is found in neighbouring Belgium, and may relate to the relatively high proportion of regulatory testing in both countries (25% of all procedures in France in 2016). Most of the procedures classified as Severe were performed on mice (233,950 procedures), but there were also significant numbers of fish (49,654 procedures) and rats (22,698 procedures). We have limited data for the trend graph, but the last three years show a slight rise, though down from the 2010 numbers. Overall, France remains one of the biggest animal users in Europe alongside the UK and Germany. 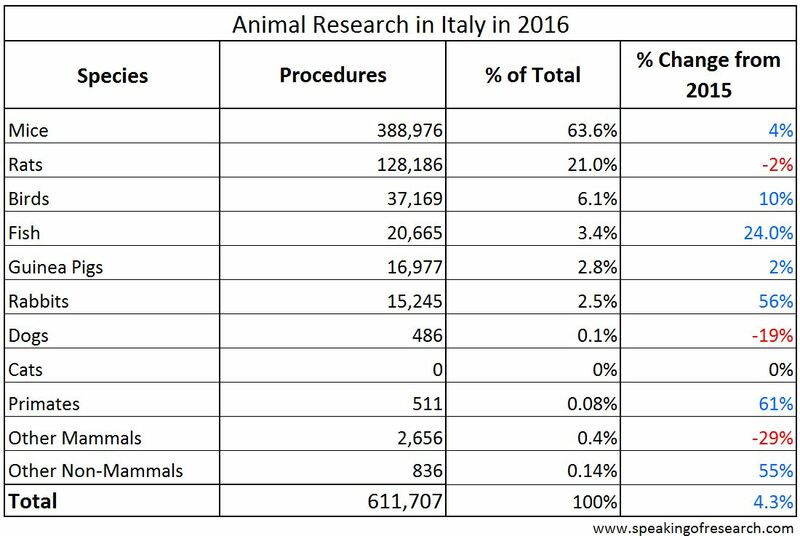 According to latest figures (permanent link), Italy conducted 611,707 procedures on animals in 2016, a 4.3% increase from 2015. There were large increases in the use of Fish (+24%), Birds (+10%) and rabbits (+56%), while numbers of dogs (-19) and rats (-2%) fell. Dogs and primates together accounted for less than 0.2% of research. No cats were used in Italy in any of the last three years. 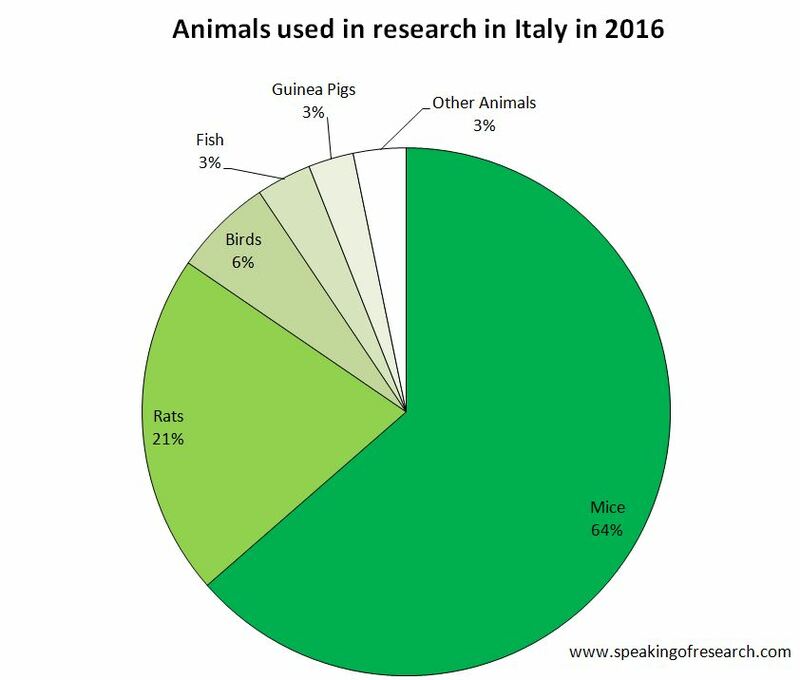 Mice, rats, birds and fish accounted for over 94% of animal studies in Italy, about average in Europe. Mild or Non-Recovery (where the animal is anaesthetised and never woken up) accounted for 54.1% of procedures, Moderate accounted for 35.2%, and Severe procedures accounted for 10.7%. Most severe procedures were on mice (233,950 procedures), but there were also significant numbers of fish (49,654 procedures) and rats (22,698 procedures). 80% of severe procedures were on mice, and 11% were on rats. 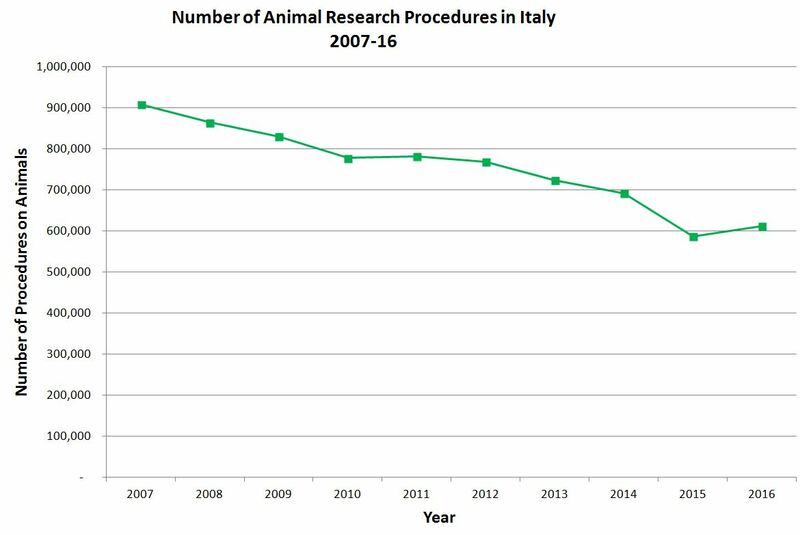 Despite the high proportions of rabbits and guinea pigs in regulatory research in Italy (see below), there were relatively few severe procedures on these species. Italy has seen a downward trend in animal use over the last decade, from over 900,000 in 2007 to around 600,000 in 2016 (a 32.6% fall). It is unclear whether the most recent rise will be sustained in the future. Science budgets have been cut in Italy in recent years, but a surprise €400 million boost for basic research announced in 2017 could lead to an increase in animal numbers in future years. The Netherlands Food and Consumer Product Safety Authority (NVWA) provides two sets of statistics – one using Dutch methods of counting methods (449,874 procedures), which has been used since 1999, and one using EU counting methods, which we are using, as it allows us to compare with other EU countries – there is also more detail for these EU statistics in the annual release, allowing more detailed comparison with the previous year. The two methods vary by around 10% and you can see this on the trend graph further down. 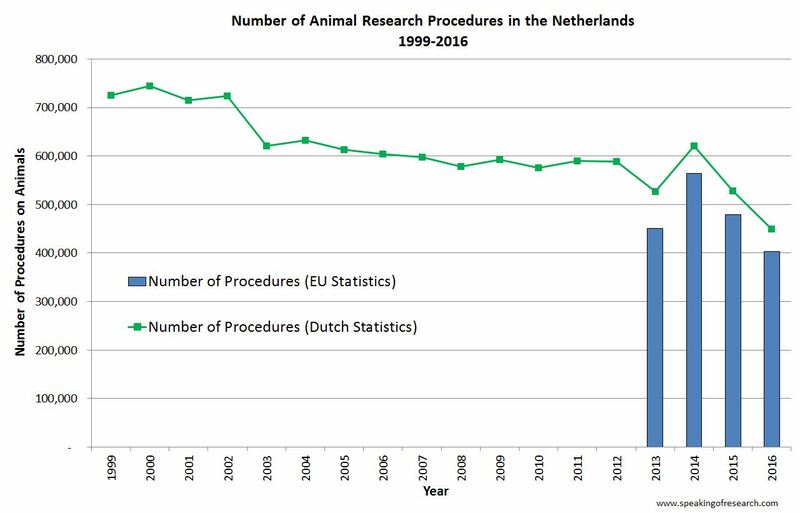 According to figures released this month (permanent link), the Netherlands conducted 403,370 procedures on animals in 2016, a 15.9% fall compared with 2015. There were large falls in the use of mice (down 34%), rabbits ( down 13%), dogs (down 13%), and primates (down 49%), while numbers of rats (+10%) and birds (+4%) rose slightly. Cats rose 46% from 61 procedures to 89. Dogs, cats and primates together accounted for around 0.2% of research animals, similar to Italy (see above) and many other European countries. 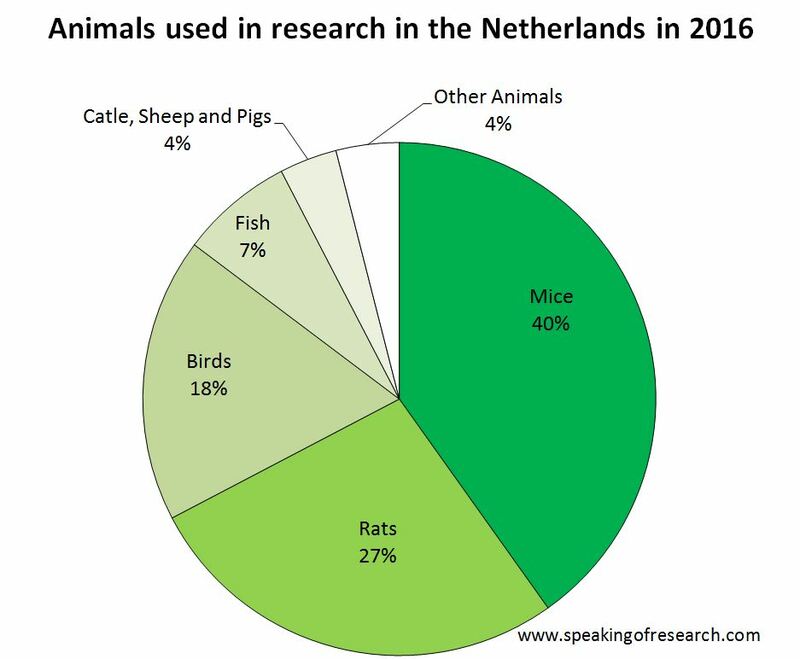 Mice, rats, birds and fish accounted for over 92% of animal studies in the Netherlands, about average in Europe. Mild or Non-Recovery (where the animal is anaesthetised and never woken up) accounted for 75.0% of procedures, Moderate accounted for 21.7%, and Severe procedures accounted for just 3.3%, a low proportion relative to most European countries (and down slightly from 3.6% in 2015). Most severe procedures were on mice (61% of severe procedures), but there was also a significant number of birds (19%) and rats (9%). 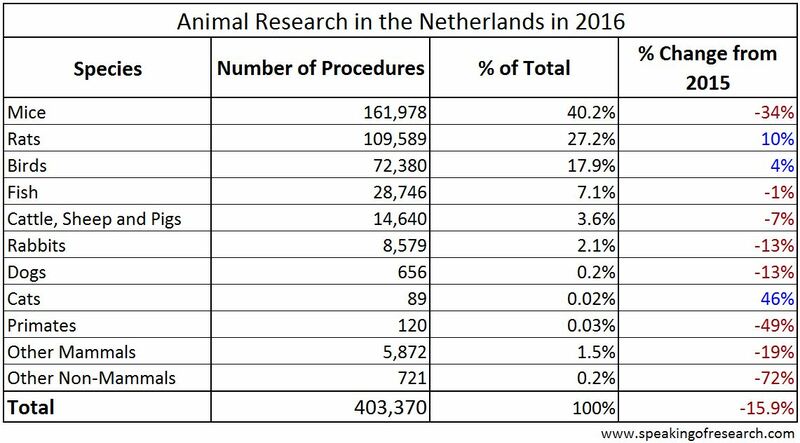 There were no severe procedures on dogs, cats or primates in the Netherlands in 2016. While the EU procedures data is limited, it is likely that had such a counting method been used before 2013, it would average around 10-12% below the Dutch numbers. Overall the number of procedures has fallen by almost 40% over the past 17 years. In the last three years ,there appears to be a marked decrease in animal procedures, but it is impossible to tell if this will continue. Posted on March 20, 2018 by EditorPosted in News, StatisticsTagged France, Italy, Netherlands, Statistics. Previous Previous post: Research Roundup: Link between body temperature and obesity found, key brain protein implicated in Multiple Sclerosis and more! Next Next post: Research Roundup: The link between inflammation, obesity and the inability to taste, the connection between anxiety and Alzheimer’s disease and more!